The Cessna 180 had a successful takeoff and is on its way! At 10:45 this morning, C-GWBI was able to takeoff from its impromptu landing strip at Obatanga Provincial Park. 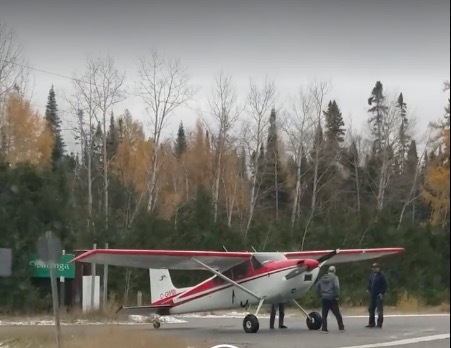 Two cruisers from the Superior East OPP Detachment blocked the highway, allowing the Cessna to leave. 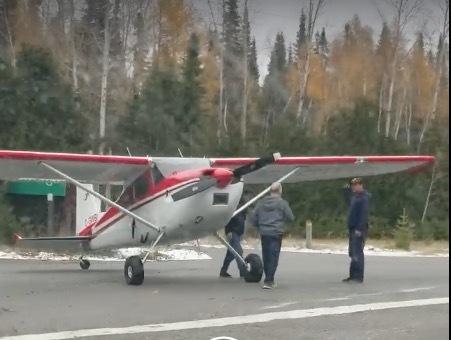 Yesterday afternoon at 12:30, this Cessna 180 made an emergency landing on Highway 17 north of Wawa, at Obatanga Provincial Park. The above photos are screenshots from a video taken by Brian Outinen. The weather was poor at the time with rain and sleet/snow, but there doesn’t appear to be any damage to the aircraft. According to a comment on Facebook, the wings were starting to freeze so they landed. Wawa-news anticipates that the aircraft will be able to take off today and resume its journey. I was the guy that helped push the airplane off the highway, I was wondering if I would be able to see that video of us pushing the plane. I am amazed and thankful they were ok and not hurt, they sure made an amazing landing and wow, thankful we had no traffic coming from both ways to get it off the road in time!